Plunge project by Arts Admin and artist Michael Pinsky. 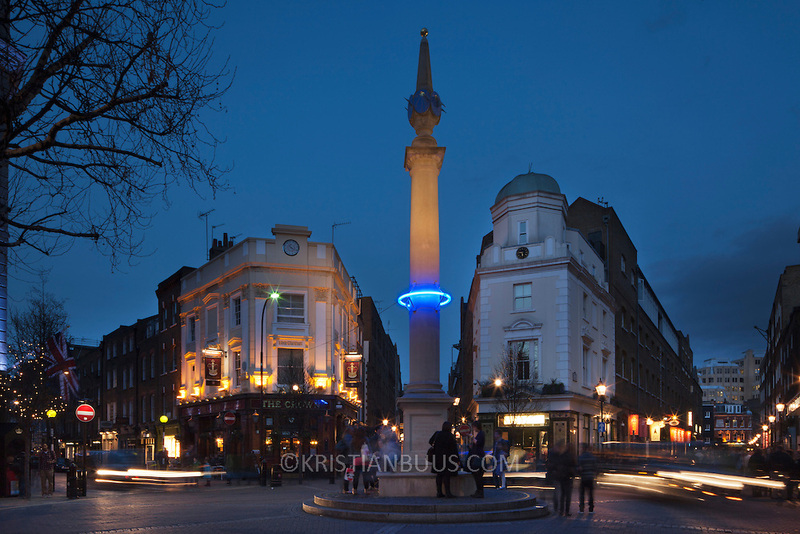 The monument in Seven Dials has been fitted with a ring of blue light at 28m above sea levels to indicate where the sea levels will be in 1000 years time if we, the human race, continue our CO2 emmissions at current rate. An estimated hight of raised seal levels will be 28m, based on current available science. 3 monuments in London have been fitted with a ring of light at 28 m above sea levels, one is on the Duke of York Monument, another the monument in Paternoster Square and the third on the monument in Sevel Dials in Covent Garden.